Way to go - you make us proud! Our 10U Tier 2 Ravens are State Champions! They went undefeated this weekend and defeated Honeybaked 4-1 in the finals to bring home to title! Our 12U Tier 2 Ravens (Blue) are State Champions! They went undefeated all weekend and defeated Saint Clair Shores 4- in the finals to bring home the Championship. This team is 42-3-1 on the season. Kensington Valley Hockey Association administers the Fall Travel & House Hockey Season, including Little Rebels from August through March. For information related to these programs, please contact the KVHA office via email at office@kvhockey.org or call 810-229-6087. The KVHA Office is located inside the Kensington Valley Ice House in Brighton, down the hallway, behind the concession stand. ...that KVHA is a non-profit, volunteer based organization, commited to the kids it serves. All KVHA Board Members are volunteers and are not paid in any way for the time they donate to the Association. ...that KVHA is not a part of the Kensington Valley Ice House or Hartland Sports Center other than as a customer. ...that 100% of KVHA fees are returned to it's members in the services the Association provides. Support KVHA with Amazon Smile!! 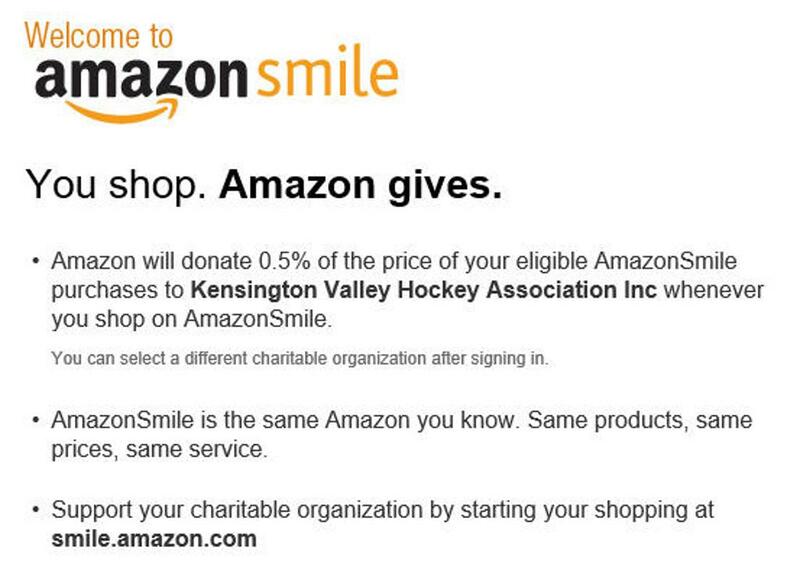 Click on the below link, select Kensington Valley Hockey Association, and all of your eligible shopping will benefit KVHA. The Kensington Valley Hockey Association (KVHA), a Non-Profit 501(c)(3) Organization, is committed to developing youth sports. We offer area youth an opportunity to participate in an exciting, challenging sport while emphasizing camaraderie, sportsmanship and fun. KVHA provides a competitive environment of learning and good sportsmanship at all skill levels for both boys and girls in the sport of hockey. This is possible through the outstanding efforts of you, our volunteers. The Coaches, Managers, Administrators and other Support Staff are the backbone of our association. We thank those for their commitment and dedication to the greatest sport in the world: HOCKEY!